"Utilizing modern methods, preserving old traditions"
H & H General Contracting is a grassroots business born out of a recognized need for honest, hardworking, educated contractors dedicated to ensuring the long term stability, functionality, efficiency, and value of each client’s hard earned investment. A life-long resident of Southern Indiana, Todd Hollins began working with his Uncle Pete installing and servicing heating and air systems at an early age. During high school Todd jumped at the opportunity to spend half his day outside, building a 1500 sq ft home, in-lieu-of class. In doing so, he received a Building Trades certificate with his diploma and, more importantly, the experience strengthened his appreciation for hard-work and the satisfaction that accompanies the completion of any construction project. With his Uncle Pete’s encouragement, Todd went on to obtain an Associate’s Degree in Land Survey from Vincennes University. He then continued his studies, focusing on math and the sciences, at Indiana University Southeast where he earned a Bachelor of Science degree. After Graduating in 2007, Todd worked closely with commercial General Contractors and Construction Managers as a Construction Surveyor and Field Engineer until deciding to start his own company. 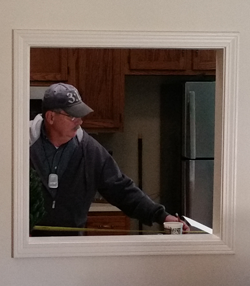 Throughout it all, Todd has always been the family and friend’s go-to man for residential improvements and repairs. As a proud new father, Todd hopes H & H General Contracting will serve as an example to his daughter that hard work and a commitment to one’s principles are the keys to success, no matter the endeavor. “HHGC believes that by focusing on each project’s long-term stability, functionality, and efficiency they are in turn ensuring the clients satisfaction and return on investment; thus becoming their preferred contractor. Over time this results in the best type of business, one that drives itself through repeat customers and word of mouth referrals." "HHGC guarantees every project is built to meet or exceed code specifications with long-term sustainability and value the ultimate goal"
Today, Uncle Pete serves as H & H General Contracting’s Chief Consultant, Estimator, and Head of Quality Control. Together Todd and Pete agree their business will build solely on the foundation of honesty, integrity, and reliability. Pete Howard began managing single and multi-family rental properties in his early teens. After several years of repairing and maintaining others investments, he began buying properties of his own. Pete enjoys restoring homes considered old or historic. His appreciation for their character, craftsmanship, quality materials, and the attention to detail of these “old” structures has influenced him to approach restoration and improvements in the same way. He likes restoring homes to their original style and condition, adding modern amenities carefully, as to not disturb the beauty of the home in its “original glory”. Pete has his Heating and Air-conditioning license and ran his own business for years. He attributes his ability to replace or repair “just about all one can, in a single family dwelling” to his Father and Grandfather, whom he is always grateful. In his professional career Pete has been trusted with the responsibility of many operations from the supervision of major construction projects to overseeing the maintenance of process and manufacturing equipment for some of Louisville's largest manufacturers. Web Design by Design Web.